Using the Lifestyle Market Analyst was de rigueur for every single student that took Management Essentials, a core course in the previous Villanova School of Business curriculum. Because this reference book was in such great demand, it was held at the front desk of the library, so we knew VSB students were visiting Falvey, and often. With the advent of the new VSB curriculum, Management Essentials is no longer offered. Would this mean demand for the Lifestyle Market Analyst would evaporate and, with it, VSB students at Falvey? The new VSB curriculum is as rigorous as the previous one. Students taking VSB 2020, Competitive Effectiveness, have an even greater need for a reference work providing market, lifestyle and consumer profiles, but they no longer need to check out the print Lifestyle Market Analyst. Now this essential source is online SRDS, renamed Local Market Audience Analyst. Like the Lifestyle Market Analyst, the online Local Market Audience Analyst has a market profile section that characterizes demographic and lifestyle proclivities of Designated Market Areas (DMA) and counties; a lifestyle analyst section that cross tabulates interests and behaviors, ranking them within DMAs; and demographic reports that illuminate interests and behaviors with reference to age, income, marital status and life stages. The online Local Market Audience Analyst augments these three core reports with PRIZM reports. 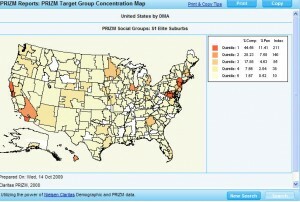 If you delight in social stereotyping, PRIZM market segments will not disappoint. The segments are based on matrixes oriented by life stage or residential locus and income level. Want to know where to find Young Digerati such as yourselves after graduation? The PRIZM report is the place to search! Another nice enhancement to the online version is the mapping feature. Now you can download market segment and demographic maps for inclusion in presentations and reports. SRDS online is also a key source for finding advertising costs. Use it to find metrics on circulation, audience profiles, advertising rates and technical specifications. Falvey Memorial Library subscribes to sections on business publications, consumer magazines, out-of-home advertising, interactive advertising, radio, TV and Cable, and international publications directories. SRDS is only compatible with Internet Explorer and can be found on the E-Reference Resources pages as well as the Marketing and Business Law Subject pages. We only hope that the migration of Lifestyle Market Analyst to an online version does not result in the depopulation of VSB students at Falvey!